The MuxLab 500401-WP-UK HDMI Econo Plus Wall Plate Extender Kit (UK) allows HDMI equipment to be connected up to 150' (45m) via 2 Cat5E UTP (Unshielded Twisted Pair) cables; the distance can be extended up to 200' (60m) via 2 Cat6 in a point-to-point configuration at 1080p 8-bit resolution. It also supports deep color up to 90' (27m) via Cat6 cable with 1080p 12-bit resolution. Made of ABS fire retardant plastic, the HDMI Econo Plus Wall Plate Extender Kit features a transmitter, a receiver, and a 110-240V/12VDC power supply with interchangeable blades. 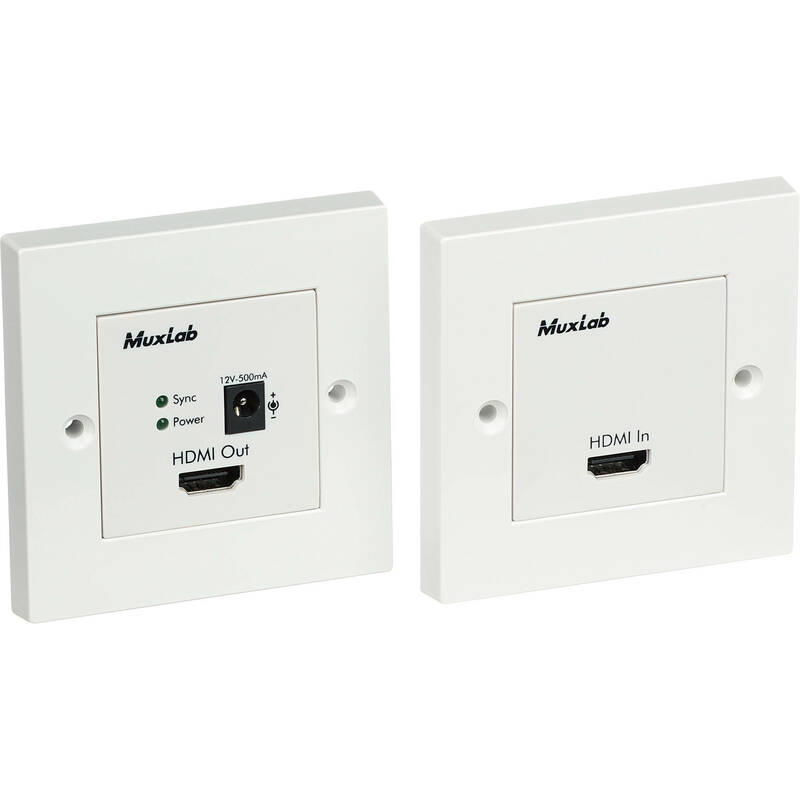 The unit includes adhesive pads for mounting, and is compatible with MuxLab mounting accessories. It is compatible with 3.3 x 3.3" (86 x 86mm) back boxes and 1.9 x 1.9" (50 x 50mm) faceplate openings. Supported HDMI equipment includes DVD, plasma, projectors, monitors, TV, PC, laptops, and servers. The extender kit is ideal for use in commercial and residential AV systems, classroom projector systems, digital signage, boardroom systems, collaborative PC systems, and medical information systems. Box Dimensions (LxWxH) 10.9 x 3.6 x 2.4"